A funny thing happened on the way to the post office. During lunch on Thursday, I took a stroll over to the one at 52nd Street and 8th Avenue. Just outside were two...Larouchers! 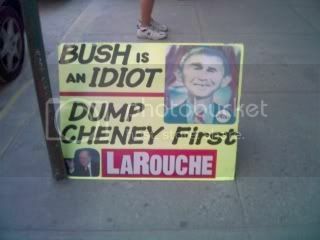 As usual, they had remarkably "intelligent" and "well-reasoned" signs, not to mention literature. (Ha!) It reminds me of when I encountered them outside the Great Social Security Debate between Michael Tanner and Paul Krugman. These pictures turned out decently, considering I had only my camera cell phone. Though this was in midtown, and not a bastion of ultra-liberalism like the Upper West Side, this was still Manhattan with plenty of anti-Bush liberals everywhere. You'd figure at least one would stop to look at the signs if nothing else, yet only one bothered to talk to the men in the five minutes I hung around, and she was already there when I started taking pictures. So think of the Larouchers' success as like the early scene in "Guys and Dolls" where Sgt. Sarah Brown fruitlessly asked passers-by for donations. He ignored me and went on bothering pedestrians for a half-minute of their time, which is too bad. I was ready to tear his arguments apart. Shall the federal government "recreate" our economy by building more railroads, when the history of federally funded railroads has been atrocious? The Union Pacific, Central Pacific and other federally funded railroads eventually went bankrupt (a great reference is "The Myth of the Robber Barons" by Dr. Burt Folsom). Look at Amtrak today, constantly begging Chuck Schumer and the rest of Congress for handouts! No, heaven forfend we should ever get more Amtraks. Shall the federal government "recreate" our economy via water power? First, water power where? Let's ignore the drier states. Here in Westchester, I live literally next to large reservoirs that supply NYC, but the nearest water source capable of generating significant power is, I believe, several hours north...in Niagara. So it's just ludicrous, especially for ones here in New York, for Larouchers to tout "water power" as a solution. Perhaps they mean the federal government can spend money building dams, which they say will generate jobs? If that's what they propose, they're wrong: as Bastiat taught us, each dollar spent by government means consumers have a dollar less to spend elsewhere. The same thing applies to building power plants: what the Larouchers are advocating is building power plants for the sake of creating jobs, not because the free market determined there's a need. 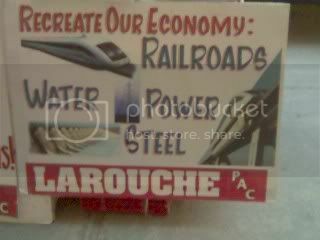 Shall the federal government "recreate" our economy by steel? How about tariffs on foreign steel? President Bush's were so successful that they cost more jobs in steel-utilizing industries than they saved in the steel industry. Or do the Larouchers want subsidies for domestic steel, though the taxes required for subsidies actually make no net difference to the consumer at best? The problem with subsidies is that the "best-case" scenario never happens: they discourage the most efficient production, meaning a net loss for society. Since the first one wasn't interested in talking to me, I turned to the other. I asked him to explain why we should focus on heavy industry. He quickly said, "Don't you believe in eating?" Eating? Of course we all believe in eating. Ask Al Sharpton, and he'll probably tell you it's the only God-given right, whereas everything else is a "civil right." The guy then said Americans "import most of our food." I shook my head and said, "That is simply not true!" He then replied, "Goodbye, sir." Did he realize I knew what I was talking about, that I wouldn't blindly accept his false information? So I pressed the issue: "Haven't you ever heard of the principle of comparative advantage?" I was about to explain why comparative advantage allows us to enjoy bananas, mangoes and other fruit from foreign countries, fruit which we can't grow enough of (if at all) domestically. My plan was to pin him with a question: "Why is it a crime to import food we can't grow ourselves, food that we enjoy, at affordable prices?" But he interrupted me again: "Goodbye, sir." I laughed and walked back to work. While the U.S. does import more food than it exports, including fruit and vegetables, that is not the same as Americans having to import most of their food. This table from the U.S. Department of Agriculture shows that in 2003, Americans spent over $496 billion in 2003 for purchased food consumed at home. This is excluding food at restaurants and alcoholic beverages; I want to deal strictly with purchased food, leaving out the labor costs associated with "dining out." Look at these trade statistics from the Bureau of Economic Analysis, tables 5 and 5a. In 2003, U.S. imports of food, feed (so we're talking animals as well as humans) and beverages (including alcohol) were roughly the same, $55 billion. Now, I'll make it even easier on the Larouchers and apply Americans' 2003 food purchases to the 2004 figures (the U.S. population has grown a little since then, obviously, and spending on food must have too). Too bad for the Larouchers: they're still wrong. In 2004, the U.S. exported $56.57 billion worth of food, feed and beverages, while importing $62.143 billion worth of food, feed and beverages. Regardless of which year's trade statistics you use, it's clear that Americans do not import most of their food. Now let's use a bare-bones statistic from the USDA: Americans spent $709.4 billion on food grown and processed in the U.S. in 2002. After subtracting the calculated marketing costs of $577 billion, that leaves $132 billion for actual food. That still is far more than the food Americans import today. So even if we strip marketing costs from domestic food and compare it to the full price of foreign food (with all the costs of transportation and tariffs), Americans still don't "import most of our food," and the Larouchers are still wrong. The real facts are that the U.S. exports more food than any other nation on the planet. California is especially a powerhouse of agriculture: the University of California Agricultural Issues Center released a paper in 1997 pointing out that "California exports more food and fiber than most countries, including such major exporters as Australia and Canada (1995 data)." Do we not hear it said every day: "Foreigners are going to flood us with their products"? Thus, people fear abundance. Has not M. de Saint-Cricq said: "There is overproduction"? Thus, he was afraid of abundance. Do not the workers wreck machines? Thus, they are afraid of overproduction, or—in other words—of abundance. Has not M. Bugeaud uttered these words: "Let bread be dear, and the farmer will be rich"? Now, bread can be dear only because it is scarce. Thus, M. Bugeaud was extolling scarcity. "But," many will argue, "if a nation is too dependent on others for food, it would starve should its trading partners ever stop exporting food to it." But they forget that the trading partners would lose all earnings from not selling, even in the extreme case of a nation being 100% dependent on others for its food supply. Consider this: like most Americans, I am 100% dependent on others for my food supply. I do not grow my own crops, raise livestock or hunt animals, or have fruit trees that I may pick. What prevents my grocer from demanding very high prices? Because if he doesn't sell to me, he loses money on the destroyed sale. Thus selling to me is as much in his interest as it is in mine. What if we develop a personal feud, and he refuses to sell to me at all? Then someone else can seize the opportunity for profit and sell to me. Thus Americans need not fear "dependency" on cheap goods from China (or anywhere else), because should China decide to stop selling to the U.S., many others (especially southeast Asian nations) would be happy to take China's place as a major U.S. trading partner. They'd be happy to seize the opportunity to earn money. They would likely have to sell for a little more, since had they been able to before, they'd have supplanted China. This still wouldn't lead to big shortages of goods in the U.S. or any other kind of economic disaster -- but it would be an economic disaster for China, that is, because it foolishly gave up the sale. "VOTE FOR ME YOU FASCIST IDIOT SMIRKY CHIMP!!!!" Helluva rallying cry ain't it? Or better yet, "We only want to have a debate with like minded people." Ummmm, that is not a debate. That's being a yes-man. I think Walter Williams wrote an article on free trade where he had a great example of NY State building a hydroponics facility so that it would not have to import oranges from Florida. New Yorkers ended up subsidizing the facility and paying more for oranges than the ones they could have imported from Florida. It was a great example of just how silly tariffs can be. In my opinion, one of the reasons America does so well economically is in part because we are, for the most part, a big free trade zone. If the EU could figure this out then they would be a tough competitor. Instead, they tried to use their (failed) constitution as a means of legal plunder. And justifies, for the far-left who are usually non-racist, the bigoted fear of foreigners.